Click on the button to read an Edutopia article about the importance of Rubrics for assessments. 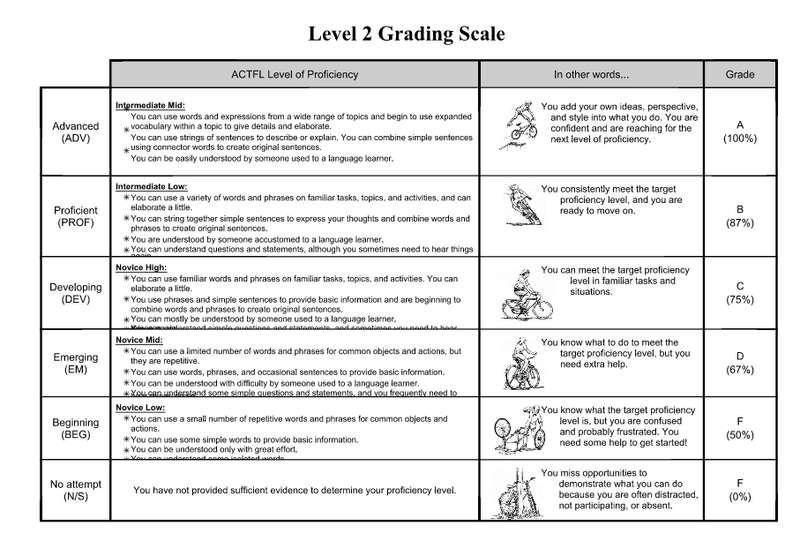 Here are a few of my Proficiency-Based grading rubrics for the lower level Spanish courses. These rubrics are general, and are used to grade almost all the work students do in my class, including both traditional and technology-based activities. If there is a very specific topic I focus on, I would create its own rubric. Rubrics are important guidelines for students to understand what they will be assessed on. Sometimes, creating the perfect rubric is hard to do and it seems something is always left out, or not taken into consideration. Here are a few tools to help you create and build rubrics to fit your needs. EssayTagger.com- this site lets you choose the area of focus, and will automatically add in the Common Core standards for you. TeachersFirst- What are important characteristics that every rubric should include? The Roll of Rubrics in Advancing and Assessing Student Learning- This is a wonderful article that talks about the different elements of rubrics and why they are so important for our students.